Marine Mammals on NMFS “Take” List for Seismic Survey – Neptune 911! Neptune 911’s mission is to bring information about the oceans to the everyday-person—persons like me. It’s goal is to help us understand how what we do affect the ocean’s well being and that an unhealthy ocean portends poorly upon our own health. Oceans are not vast wastelands, but one of the driving forces of planetary survival. Thank the oceans for every other breath you take, for food, climate regulation, medicine, recreation, economy and transportation. The ocean is a living space that dominates the planet. And like the land we walk across and build our homes upon, geologic fault lines run thru the sea’s bottom. 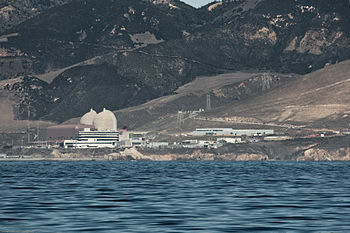 And that’s the subject of this blog—an inconvenient truth that highlights the assumed wisdom of the construction of a nuclear power plant (Diablo Canyon Power Plant) along the Pacific west coast just outside of San Luis Obispo, CA, commissioned in 1985. The Hosgri fault lies about three miles offshore from the nuclear powered plant. The San Andreas fault keeps rocking just 45 miles east of the plant. The Hosgri fault churned up a 7.1 earthquake in 1927. But a recent discovery of another fault line The Shoreline Fault (shown in the adjoining illustration), really rattled geologists, engineers and the community, as a whole, regarding the overall safety of “El Diablo,” as some activists refer to the power plant. On paper, the nuclear powered plant reads well-engineered and prepared for a likely earthquake of 7.5 magnitude, and adequately placed above the reach of a possible tsunami. That was until the devastation of the Fukushima Daiichi Nuclear Power Plant following the largest earthquake in Japan’s history on March 11, 2011. 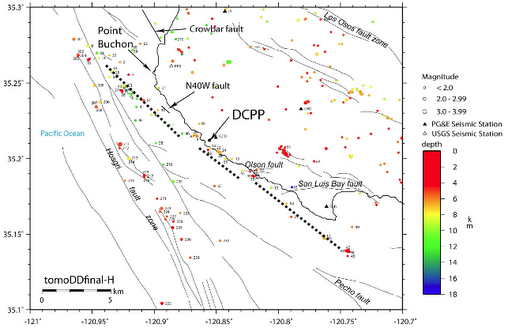 This summer, Pacific Gas and Electric (PG&E), owners of the central coast nuclear power plant, began “low energy” seismic exploration to better understand the faulting along the ocean’s real estate that could impact the power plant. Seismic testing. Forgive me for quoting WiseGeek as a preamble to where this blog is headed: Seismic-induced waves inflict heavy damage on the environment, especially on marine life. The heavy sounds and vibrations can cause permanent damage to marine animals. Such testing can also cause damage to tourist spots such as Florida and California. The decibel level to shatter glass is over 100dB. So a jackhammer at 95 db would just irritate nearby neighbors and not shatter their wine glasses. A jet engine produces about 140dB. Hearing tissue dies at 180 dB (that means the 150dB at a rock concert won’t kill your hearing tissues, that much). Here’s what PG&E proposes as reported by Dan Bacher for the Daily Kos: According to a PG&E representative at an informational meeting, the proposal calls for a 240-foot ship to tow a quarter-mile wide array of twenty 250 decibel “air cannons,” along a 90-mile stretch of California’s Central Coast. The cannons will shoot deafening underwater explosions once every twenty seconds, day and night, for 42 days and nights. The region of California’s Center where this devastating assault on wildlife is expected to take place includes the “protected” Point Buchon State Marine Reserve. “Takes of Marine Mammals Incidental to Specified Activities; Marine Geophysical Survey off the Central Coast of California, November to December, 2012,” is an interesting National Marine Fisheries Service (NMFS) document that reviews the survey specifics as related to local marine mammals and marine life. The 116-page report bounces like a seismic blast from “To avoid the potential for injury, NMFS (1995, 2000) concluded that cetaceans and pinnipeds should not be exposed to pulsed underwater noise at received levels exceeding 180 and 190 dB re 1 μPa (rms), respectively,” to (paraphrased in my own non-scientific language) promising that every precaution and stopgap protection of any and all marine life will take place at all times, to the very title of the document “Takes of Marine Mammals…” a listing of possible “takes” of marine life. The power company has even set up a claims process to compensate the local fishery industry and business that may suffer financial loss due to the seismic testing. Neptune 911 reported on the proposal earlier this year. The testing has begun at lower levels and the fallout has finally struck what I earlier feared to be a complacent community. Taking on corporate energy giants like PG&E is a task as intimidating as the San Andreas Fault line. It is a Jonah and the whale, or a David and Goliath sized challenge. We all use energy. It took maybe 45 watts to write this blog, 985 watts to brew the coffee I’ve sipped while writing, plus the power used to light the lamp next to me. So I consume energy and I understand the need to power up. But what dims my inner light are questions as to why a nuclear power plant was ever built in a known active earthquake zone, and why safe and renewable energy resources remain the stepchildren of the energy business. Now that “the devil” lives on a coastal bluff with active fault zones in kissing distance, the sudden need to better understand the potential for disaster, the acknowledged “take” of marine life—some endangered and others protected—and then the cost added to my electric bill, just added John Q Public to the take list.